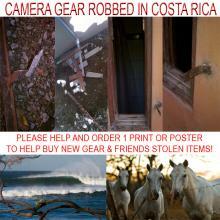 My Cameras, Lenses, Laptop, and Were All Stolen in Costa Rica. Please Help! I am writing this message to sincerely ask for your help. I recently had all my Cameras, Lenses, Laptop, and other gear Stolen while traveling in Costa Rica. My friends also had numerous personal items stolen as well such as cameras, cell phones, dive gear. It was a huge loss to me personally and left me without the necessary tools I need to run my business. Luckily I was backing up all my images on a portable external drive the thieves didn't take. I am asking people who live in the USA that might feel generous and willing to help and show support, by ordering 1 print or poster of the Costa Rica images I photographed. So I can begin to buy new gear and also buy the items my friends had stolen..
All I ask is for is help and possible generosity in getting my business back running again. Photography is my passion and what i truly live to create and share. Help me continue to follow my dreams and capture moments in time. I first visited Costa Rica in 1996, traveling across the country for one month and it was a life-shaping experience. Needless to say this 2nd visit in 2012 has also been one. Good and Bad. I hold no ill will towards the community and towns people of Playa Nosara, Guiones, Pelata, or the country of Costa Rica. As a whole my experience and trip was a fun one, full of lasting memories with my family and friends. From what I experienced during the majority of my trip, the town of Nosara is a beautiful place and full of many good people just trying make an honest living and enjoy life. It is unfortunate that a small group of people of low moral character seek to plunder and hurt the tourists, locals, and business owners in that community. PLEASE SHARE THIS POST TO YOUR FRIENDS WHO MAY WANT TO HELP!!! On Tuesday March 20th in the evening between 9pm-10pm, our rental house in Playa Nosara, Costa Rica that myself, sister, her fiance, and friends were staying at was broken into while we were eating dinner less than 100 feet across the street. It was our last night in Costa Rica and the thieves knew when and where to make the hit. All of my party, local friends, property manager, and numerous Nosara residents suspect we were set up by a local Female Yoga Instructor that had befriended us, we think to gain the information necessary for her friends to pull off the robbery. Without going into the whole long story, her actions that night such as: Fleeing the scene after learning of the robbery without notifying any of us whom she was having dinner with, Insisting we Do Not Call the police and Do Not Get the Police Involved, suggesting one of us drive her to the ghetto with our rental car to go talk with a friend of hers, and insisting later that night we abduct a local Costa Rican so we may take him into the bushes and rough him up for information were just some examples of many, that bring us continually back to suspecting the Female Yoga Instructor. Since that night we have learned that she dated a notorious thief in/around Playa Nosara that the community and business owners fear. Her father is a convicted criminal in Canada who career spanned 35 years and include crimes such as attempting to pay an undercover officer 10,000 to kill a witness in a drug case against him. As well as tax evation, credit card fraud, mortgage fraud. Her mother has also plead guilty to the 3 ladder charges. This entry was posted in Editorial, Magazine . Bookmark the permalink. More of photos from My Cameras, Lenses, Laptop, and Were All Stolen in Costa Rica. Please Help!